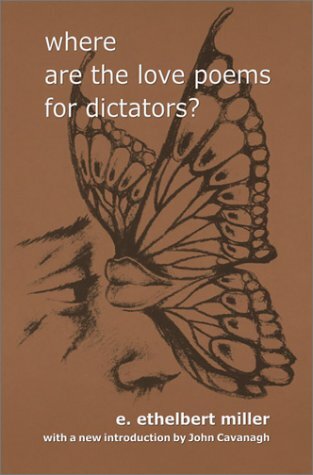 Title : Where Are The Love Poems For Dictators? William Wordsworth, possibly the most famous poet of the romantic period of literature defined Poetry as “the spontaneous overflow of powerful feelings.” In this idea, E. Ethelbert Miller has crafted a strong, and often times thought provoking collection of poetry with “Where Are The Love Poems For Dictators?” (Open Hand Publishing, 2001). This collection of poetry from Miller is a combination of ideas broken into three sections, spanning ninety-three pages. Section one, “Days of Protest/Nights of Peace” is a collection of politically charged poems dealing with the people of South America and Africa. Section two “Dead Flowers,” is, for the most part, a collection of love poems. The final section, “Poems from Blue Mountain” is an experiment with African Folklore. E. Ethelbert Miller has crafted a work here that spans various political and emotional levels, sometimes in a way that connects to the reader on a deeper level, other times, missing it’s mark. While most of the poems found in “Where Are The Love Poems For Dictators?” are solidly constructed, meaning more often than not within this collection each poem has something that catches the reader, he falls short on some of his executions. His attempt to write from the point of view of those living and suffering in South America and Africa can leave something to be desired. It seems that Miller crafts his best work in the latter two sections of “Where Are The Love Poems For Dictators?” These two sections deal more with the ideas of love and everyday happenings and observations that are crafted into, at times, beautiful works. It’s when Miller strips his work down to it’s simplest that it is at its most effective. One of the most powerful poems from “Poems from Blue Mountain” is also the shortest in the book: Untitled	when	you’re	small	white	folks	always want	to touch	your head	for good luckPoems like this, constructed in the simplest form with line beaks that emphasize individual ideas, are what Miller does best; it’s when he forces ideas or points of view that “Where…” can falter. E. Ethelbert Miller appears to be a master of capturing true human emotion in the most basic and subtle of ways. In the poem “The Kid,” Miller contrast a conversation between two men discussing a new baseball player in the league with a subtle connection to the death of one of the men’s fathers. In this style, Miller can be seen to shine; his subtle connection from extraordinary to the everyday is refreshing and original. While it seems most books of poetry range from topic to topic throughout, Millers compiling from section to section was effective. The only downside to this approach within “Where Are The Love Poems For Dictators?” is that the section that appears to be the center of this work, “Days of Protest/ Nights of Peace,” is the weakest among the three. It’s important to note that E. Ethelbert Miller is a literary activist when reading this collection of poetry. He does a great job throughout layering ideas of political corruption and the human response. Miller does do a fine job of capturing emotion of his characters, at times he slips away from some of the elegance found in other poems, but as a whole Miller creates a strong work that raises questions and illuminates the “everyday” in a new way. This book merges the political with the humanistic. I know this isn't one of e. etherbert miller's quintecential works, but it is a damn good book. As a former employee of Open Hand Publishing, which is probably the only reason I came across this book, I am awestruck by genius by this poetry, and all of his other poetry. I wish I could meet this man and have him sign the book I used to promote for him. Anybody with any ideas, let me know. What a collection! And such diverse topics, to split the book into three sections. These poems are nicely done with an international flavor and a social conscience.